We possess a letter from Polycarp to the Church in Philippi. It reveals his firm adherence to the faith, and his pastoral concern for fellow Christians in trouble. An authentic account of the martyrdom of Polycarp on February 23 is also preserved. It probably occurred in the year 156. The account tells of Polycarp’s courageous witness in the amphitheater at Smyrna. When the proconsul asked him to curse Christ, Polycarp said, “Eighty- six years I have served him, and he never did me any wrong. How can I blaspheme my King who saved me?” The account reports that the magistrate was reluctant to kill the gentle and harmless old man, but his hand was forced by the mob, who clamored that he be thrown to wild beasts, as was the fate of other Christians on that dreadful day. I O God, the maker of heaven and earth, who didst give to thy venerable servant, the holy and gentle Polycarp, boldness to confess Jesus Christ as King and Savior, and steadfastness to die for his faith: Give us grace, after his example, to share the cup of Christ and rise to eternal life; through Jesus Christ our Lord, who liveth and reigneth with thee and the Holy Spirit, one God, now and for ever. Amen. II O God, the maker of heaven and earth, you gave your venerable servant, the holy and gentle Polycarp, boldness to confess Jesus Christ as King and Savior, and steadfastness to die for his faith: Give us grace, following his example, to share the cup of Christ and rise to eternal life; through Jesus Christ our Lord, who lives and reigns with you and the Holy Spirit, one God, now and for ever. Amen. I think the readings are particularly appropriate for Polycarp. Can’t say that for every one in HWHM! And love the Lego martyrdom pic. An illustrated HWHM would be fun! This post was very synchronistic for me as a friend last night was recommending some Gnostic Christian teachings on reincarnation, and I was explaining to him that those teachings are not part of the core of orthodox Christian teaching. Thank you and thanks to St. Polycarp! I’m confused. Was he martyred by wild animals or by burning? Surely it was one or the other, not both. Did something get inadvertantly dropped from the narrative? What’s with the Legos? This is dispectful of a truly saintly early martyr. There must be thousands of icons of Polycarp; use one of them. There is a lovely icon next to the collects. I vote with Stacy: I think the Legos are kind of fun! I think this one is about as perfect as we’re likely to get. There’s still no clear line between pure petition and a “so that” clause, but lacking one, this is about as nice a homogenized blend as we could have. (“Give us grace, following his example, to share the cup of Christ and rise to eternal life”) It’s almost as if we intend to get fed to animals, burned, stabbed, and all that, ourselves. (Which, of course, if we were being truthful, is exactly what we’d be praying NOT to happen to us.) But, absent a real “so that” clause (i.e., one we WOULD be willing to undertake), this one at least sounds good. For Polycarp. Lin – thanks for the clarification. The narrative as written for HWHM does not make the connection. The account as written “….but his hand was forced by the mob, who clamored that he bethron to wild beasts, as was the fate of other Christians on that dreadful day.” Read alone, the grammar and logic suggest that he was thrown to the wold beasts. “…his hand wsa forced” suggests that he gave in to the mob and handed over with the other Christians. The account you cite does make this clear, but with no transition, the paragraph beginning “Poluycarp was burned at the stake….” sounds indeed like he was killed twice. That’s steep even for a saint. This needs a rewrite., along the lines that you cited. And I agree with about the Legos. Horribly inappropriate. Burning to death was not “cute.” Read Foxe. Actually, the story in the ancient Martyrdom text is the the flames refused to touch Polycarp, so the proconsul ordered a soldier to kill him with a dagger. Since I seem to be in the minority in objecting to the Legos, presumably we can look forward to Lego depictions of Martin Luther King being assassinated, Dietrich Bonhoffer being hanged, and the discovery of the bullet-riddled body of Janani Luwum. In the pre-Vatican 2 Roman calendar, St. Polycarp’s feast day was the same as my birthday, so I always thought of him as my patron, and I think the commemoration is a keeper, particularly given the Saint’s courage and confession of faith. I agree with Cynthia and John about the Lego figures; the icon is very nice; I hope St. Ignatius of Antioch is a candidate for inclusion in the calendar as well. Ignatius of Antioch is commemorated on October 17th, and is already included in the calendar..
Wow, that’s kind of snarky, isn’t it? Yes, there were many other martyrs who suffered (St Agatha, anyone?). I don’t think anyone said burning was cute. But as an elementary school teacher I found the Legos made me stop & think– a good thing– and I think Polycarp is pretty much beyond being insulted. Even though it’s a little off the topic of HWHM per se (since the illustrations, so far as I anticipate, will not be part of the final results) it’s thought provoking to consider the reactions to the non-standard portrayal of Polycarp in Legos. At first I was taken aback very briefly, and then I wasn’t. I think of a crayon drawing a little girl gave me a week or so before the 9-11 attack, which was simply an array of simple crosses on the page. Arrayed in all orientations, it reminded me of the people who died at the WTC. I framed it and hung it outside my office door. I can easily imagine someone — maybe a child, but not necessarily — finding the Lego portrayal sobering, even powerful, if they take the story to heart and relate easily to something so simple as Legos. One Good Friday a young boy was profoundly moved by a “home made” service bulletin cover with a line drawing of Jesus on the cross. I doubt any of the adults present took it so profoundly to heart, but this one child did. The “flip side” is that as an adult, who often labors under the illusion that I’m somewhat sophisticated about aesthetics, devotion, contemplation, etc., I have trouble being moved by some media that clearly deserve their place among the varieties of Christian devotions, and yet don’t draw me in as they do others. Classic ikons, for instance, are loved — and have been for centuries — but I don’t find they have more power for me than other representations. Flipping through the illustrations in old Bibles, which are often amply illustrated in a variety of ways, I can find traditional depictions of important events flat, void of human expression, and stereotyped to the point of caricature. Thank you SCLM for the illustration, and thank you to those who shared their reactions. That’s pretty much what the blog is seeking. I did not intend to cause any offense by choosing this image today, but rather found it an interesting and thought-provoking modern portrayal of the Polycarp icon. Each month’s moderator chooses the image(s) for each commemoration, so this image is not representative of SCLM as a whole nor will it be included in HWHM publications. Thank you for engaging in this conversation; I apologize if it detracted from the example of Polycarp. John – you are not alone. Even in this ephemeral format, the Legos are tasteless and insulting. I hope not to see any more. I have to say that I think the humor of the Lego depiction fits into a consistent theme in the hagiographical tradition itself. Viewing it, I was reminded of Polycarp himself as he was exhorted to burn incense to Caesar and to say, “Away with the atheists.” The story reports that: “Polycarp solemnly looked at the whole crowd of lawless heathen who were in the stadium, motioned toward them with his hand, and then said, “Away with the atheists.” He used humor in the face of torture and death not to diminish the injustice of it but to insist that death and the agents of death have no real power. Certainly we won’t all agree that a Lego “icon” achieves this end. However, I think it benefits us to be reminded that sometimes laughter in the face of death is a holy act. For heavens sake lighten up folks. There were many jokes about Polycarp way back when I was in Seminary. I doubt Polycarp would care since he was a true Saint. LEGOs transcended being simply a “toy” in the 1980’s. Their use in art has been well documented and highly acclaimed. They are an as much a source to pull on to create an icon as paint, clay, or stone. I think the rendition used is both tasteful and respectful. It is always how you use a medium of art, not what medium you use. re Legos – read Foxe. Not funny. I don’t know about :Legos as art – lots of things have been proclaimed art in recent times, some of them normally consigned to the sewar or trash cans. Legos are not filthy, just juvenile and disrescectful. My main point is that we should be consistent. 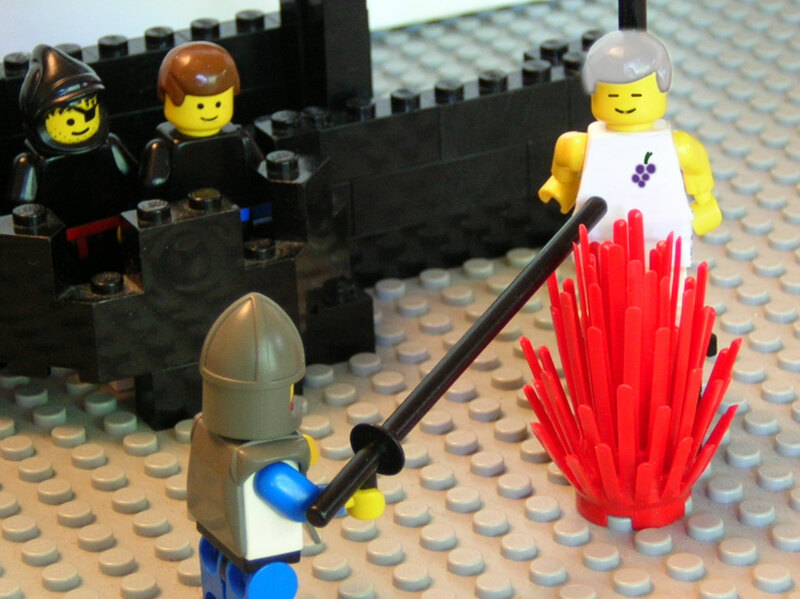 Depicting S. Polycarp’s gruesome martyrdom in Legos, though juvinile and banal, may be cute. But if you do find it touching (in a twee sort of way), you should likewise find Lego depictions of more contemporary martyrs (e.g., MLK and Bonhoffer) equally charming. But I’m betting a lot of people who are charmed by the formere would be horrified by the latter. The collect refers to Polycarp’s “boldness to confess Jesus Christ as King and Savior.” Here we get to the crux, I think (literally speaking) of a division in TEC today. How do we do evangelism? We’re all agreed, I think, that it should be done in deed: working for social justice, MDGs, and so on. But there are other “bold confessions” in the world today, such as Islam, and we have separation of church and state–which means there are arenas where we may not “boldly confess,” with our words (and rightly so) that Jesus Christ is King and Savior. The problem for evangelism, I think, is that even in our own homes and churches many of us hesitate to do bold verbal evangelism, as Polycarp did. And evangelical programs that I read about in some seminaries do not list leading people to Christ as their savior and Lord as a goal in their missionary work. Just a comment–I don’t know what to do about it, other than to say I think we have a problem and a challenge. 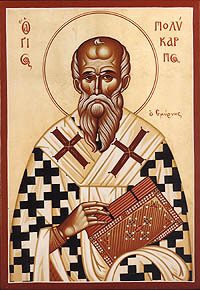 That Polycarp was a bishop is not why we commemorate him: I would prefer the simple subtitle “Martyr at Smyrna”. Line 1, first paragraph: add “(born in AD 69)” after “Polycarp”.